Living and working on Maui, I am inspired by the water and sky and by the tropical profusion of flora, and fauna. One result is my series of impressionistic seashell beads. I am also fascinated by flowing volcanic lava. The volcano (Haleakala) here on Maui has long been dormant. Not so Kilauea on the Big Island. It has been spewing out lava continuously since 1983. 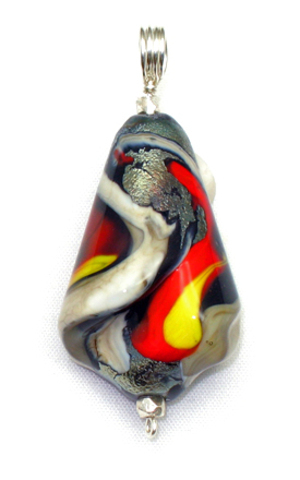 This bead is my latest attempt to capture the volcanic activity in glass. Once again I didn't fully succeed but I liked the bead anyway. Consistent with the texture of cooling lava, there are deep folds in the lower portion of this bead. The bead is designed to be worn on the black satin cord that comes with it or it can be strung on a favorite chain. The bead has a hand formed sterling silver wire bale that is approximately 3/16" in diameter ... large enough for most omega and similar chains.